The recent release of annual 2016 financial results for Ontario Power Generation (OPG) completed data requirements for updating one of my favourite, and I suspect most impactful, spreadsheets. I was particularly curious to find out which generator was the lowest priced of them all in 2016. By my measurements, it is Bruce Power. While I was anxious to see the annual figures in this old format, what impacted me the most from the graphic is that 10 years ago there was some consistency in pricing. Since that time there's been some movement in public OPG's pricing of its traditional hydro-electric and nuclear assets, even less change at nuclear Bruce Power, but enormous changes in the average cost of "other Ontario" generation. Explaining the changes required some explanation of the data, my methodology, and the changes in the composition of "other" generators. Upon creating the explanations, I realized I could improve my original spreadsheet. If you see some variations to my previous posts, it's because this is the improved version. 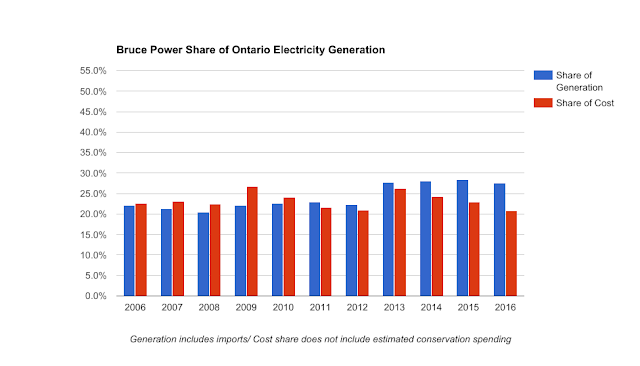 embedded generation annual totals from the IESO's Ontario Planning Outlook as available, with my own estimate for 2016 - this generation is valued at the weighted (by demand) average HOEP for the year for the purposes of determining a total system cost. Basically the few items that produce the majority of Ontario's generation are examined as simply as possible (based only of revenue and generation), and what is left is determined by separately calculating the total collected for the system (the market value plus the global adjustment). These figures do not account for total Watt-hours of curtailment (avoided production), but the costs of curtailment is contained in the global adjustment and therefore total system revenues. My accounting could be considered unfair, but I use this approach to avoid using posted rates that can't be used to determine actual consumer expenses (which is the same as producer revenues). 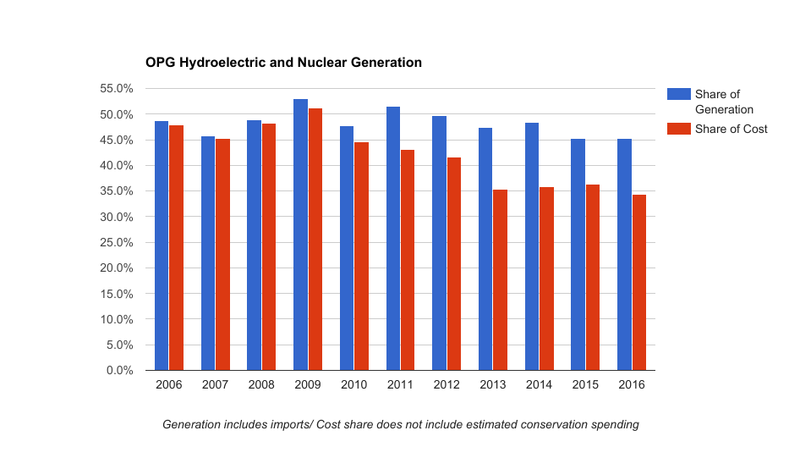 To note numerically what is graphically displayed above, between 2006 and 2016 the combination of OPG's legacy nuclear and hydro assets and Bruce Power grew share of total Ontario production, from 71% to 73%, while the share of total costs for those generators dropped over 15% from the same 71% share as in 2006 (to 55%). All other generators in the province dropped 3% as a share of overall production, while their share of system costs increased over 20%, to 47% of system costs. 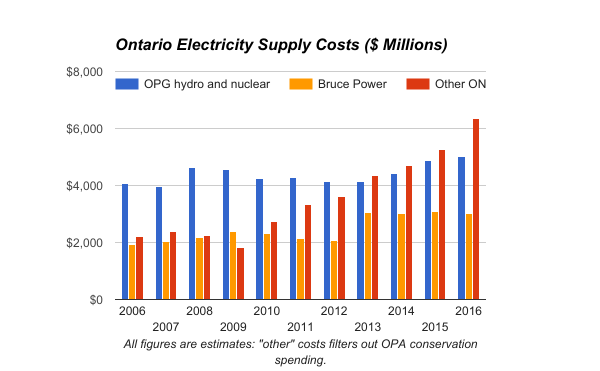 The cost of all Ontario electricity supply increased by approximately 6.4 billion, 65% of which could be attributed to growth in cost that were neither nuclear nor legacy public hydro. Public power does not necessarily mean cheaper power - at least not new public power. OPG has reorganized its business segments in recent years. The old thermal segment was primarily coal-fired generation, and Lennox (oil and natural gas acting, essentially, as an emergency reserve). Today Lennox is contracted, as are Thunder Bay and Atikokan (coal units converted to biomass). These generators share a new "Contracted" business segment with recent hydro-electric projects co-owned with First Nations. All contracts are private, and apparently most are expensive - as can be seen by separating this component from the remainder of "Other ON". This graphic could easily be misconstrued as indicating OPG's "contracted" generation has been driving price increases, but it's actually a minor contributor - the high rate is applicable to few TWh. I estimate the cost of wind, solar and conservation neared $4 billion in 2016, so that is the majority of costs not associated with nuclear or legacy hydro. 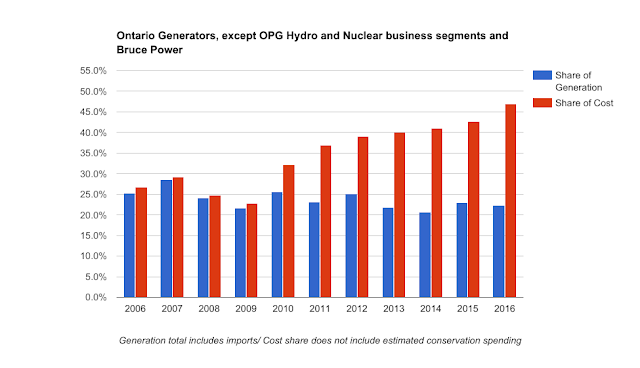 However, the "contracted" OPG business unit is interesting partly because much of it is capacity resources - Lennox and Thunder Bay are both paid to be capable of generating. This is also true for some of the other generation, particularly the gas plants with Net Revenue Requirement contracts. "Other" in my accounting includes both capacity contracting and energy contracting. Coal provided both of these things for around $2 billion. 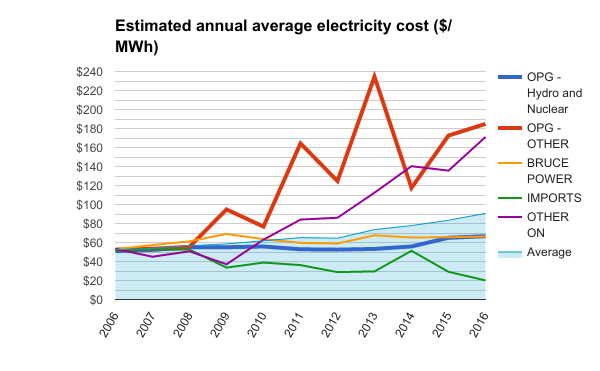 Ontario replaced coal-fired generation twice, and that's one part of the reason costs tripled for this category: the capacity resources that are minor contributors to rate increases, while more expensive wind and solar contracts are the majority of the cost. With production not dropping as demand has, much of the production for intermittent renewable energy systems has been exported, or curtailed; what hasn't been dumped is displacing potential gas-fired generation from the capacity resources. The last issue I'll discuss in this post deals with the blue area in the previous graphic. This is the estimated average rate paid for generation in Ontario (including imports). 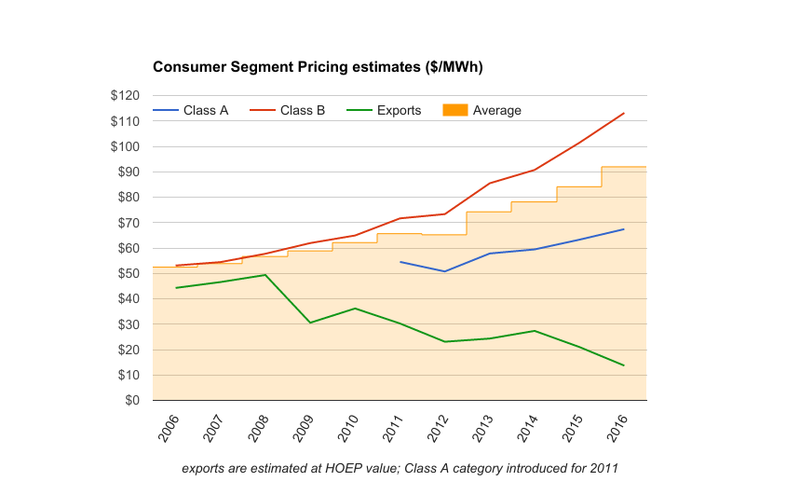 The average rate is shown as increasing from $54/MWh to $91/MWh, but as noted in my previous post, the increased cost is not distributed to all market segments proportionally. From 2006-2016 the average rate increased 74-75%, but over the same period there was a 113% rise in "class B" rates (essentially including the Regulated Price Plan rates applied to residential consumers). This post, and the previous one, looked in difference ways at the changes that led to today's high rates. 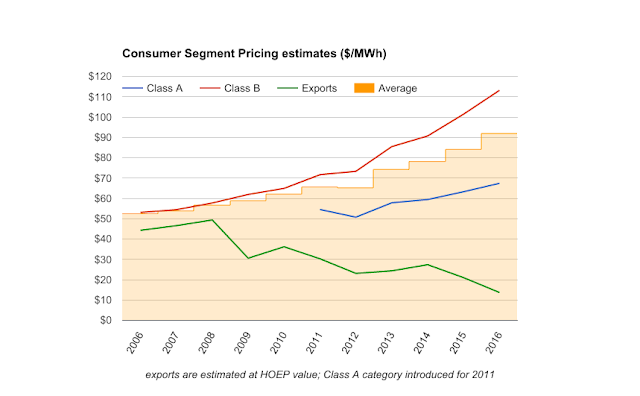 Both posts noted rate increases have been significantly due to newer generation, primarily wind and solar, and both posts noted different consumer segments have been impacted differently as not all segments have borne the weight of all price increases. The next post will look at recent announcements indicating how the government intends on addressing costs prior to the next election campaign.